alisaburke: red and green and delicious! red and green and delicious! 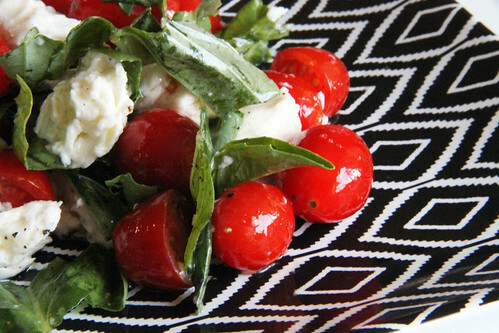 Caprese salad is a simple Italian salad consisting of tomato, mozzarella and basil. 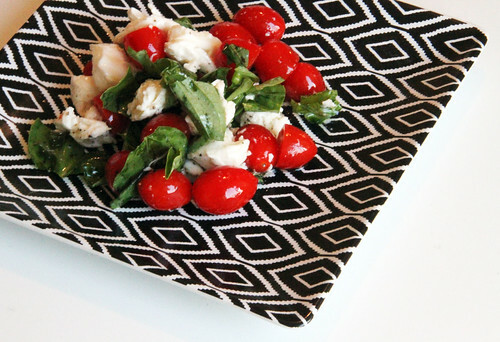 It is typically served as sliced tomatoes topped with a piece mozzarella, a basil leaf and then drizzled with olive oil and basalmic vinegar. While I love the traditional sliced version, I decided to make a salad that was little easier to eat, could serve lots of people or be boxed up for leftovers. 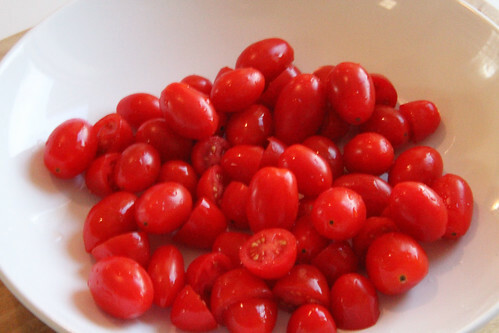 I started with baby tomatoes- these could be either served whole or sliced in half. and added it to the tomatoes. Next, I ripped up pieces of mozzarella. 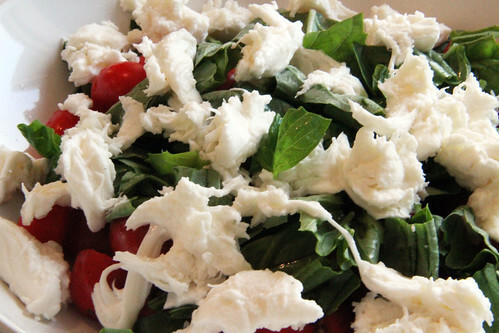 Let me just say this about the mozzarella- it must be good quality, fresh and the creamier the better. 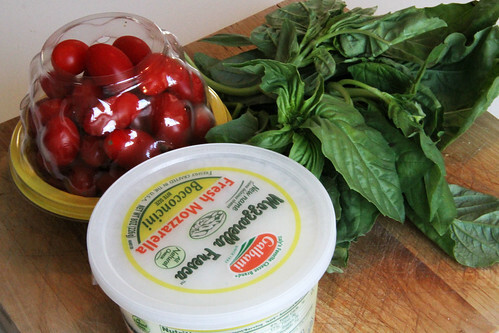 Often the good mozzarella is sold in a container with 3-4 round balls floating in water (or brine) and will be the creamiest. The last step is to drizzle with olive oil and balsamic vinegar- if you like the flavor. 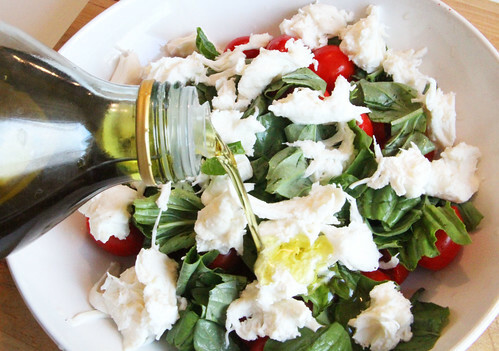 I love balsamic on my caprese salad but my hubby prefers just the olive oil. Finish with a sprinkle of salt and pepper. Toss everything together and serve. Just looking at this photo makes my mouth water! and has a very festive color palette- perfect for holiday entertaining! It looks so yummy! What a great recipe, I might try it for the Holidays. Thanks for sharing Alisa!!! Ooooh, i'm starving now!! That looks so good. sigh. 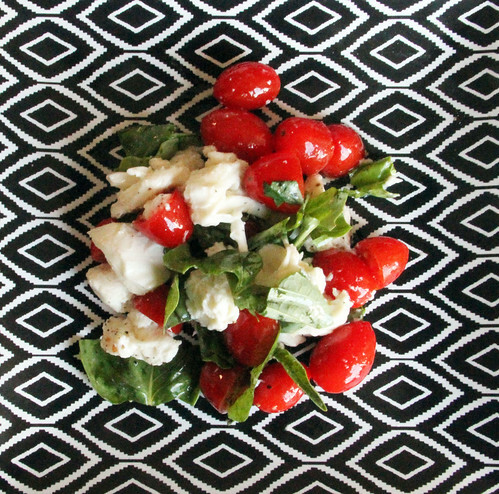 I love insalata caprese but first of all I LOVE YOUR BLOG AND YOUR CREATIONS! Since when I found it, last month, I came to visit it every day! It is full of inspiration. 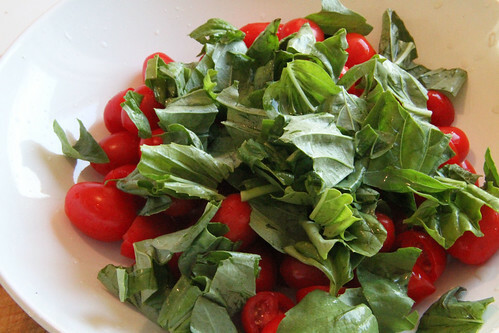 What a beautiful salad- and such a wonderful splash of holiday color! Also, what a great plate- it looks like fabric in the first shot! Thanks for sharing! This is so beautiful and so simple. Wonderful! You are a rock star when it comes to photography! Your salad looks so so good! hugs to you.. thks for sharing this with all of us.. and u are right, that cheese looks sooo creamy! It is the perfect party snack. My niece brought it to a party once and now I like to do it. Just don't cut the tomatoes in half. 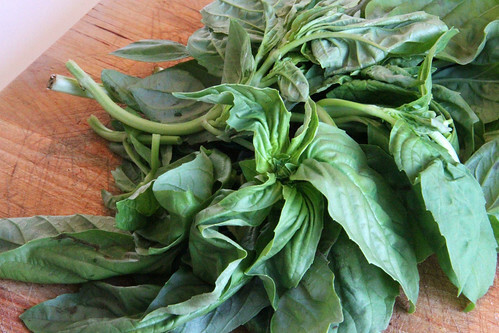 Combine the tomatoes, cheese and basil but don't add the oil and vinegar till you get to the party. Everyone loves it. My son prefers just the oil too. Great idea! I usually only have the little sandwiches in the summer when tomatoes are fresh out of the garden. But doing it this way like a salad with the tiny tomatoes sounds wonderful. Now that I think of it, I've seen something similar to this with chunks of bread toasted a bit. Geez, I might have to make this for lunch today. Or breakfast. 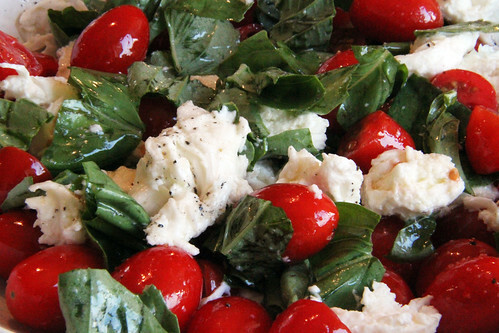 the caprese salad was a staple in my house growing up...my mouth is watering right now just looking at the photos!!! I've seen recipes for this before and have always wanted to try it and am totally making it for Christmas! So easy, and so yuuummy!! Thanks! this is one of my favorite dishes for sure. perfection on a plate! Mmm, yum! 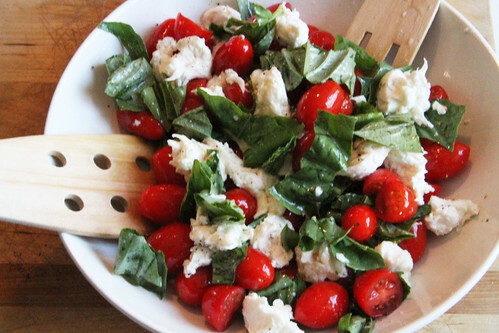 I never think about eating caprese salad in the winter, but it IS festive after all. Your photos of food always look superdelicious. 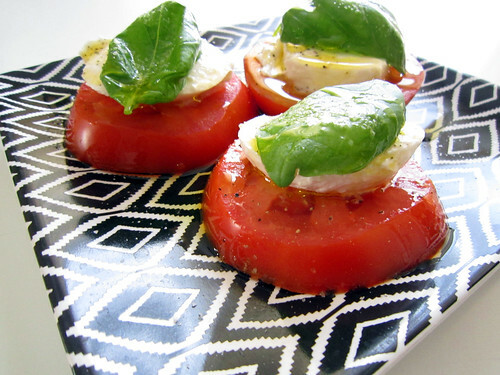 Yummmmmmmmm..my second favorite thing with tomatoes is brushetta...love it!! Alisa, I absolutely love the recipes you share here. Thank you!!! easy ways to give back right now!